There’s nothing we love more than being able to get back outside. 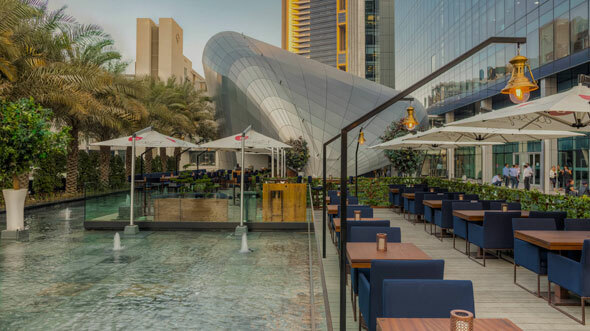 And in Dubai, we’re spoiled for choice when it comes to drinking and dining Al Fresco. From romantic rooftops to sundowners in the sand, we’ve rounded up an extra long list of outdoor spaces to fill your Instagram feed with. 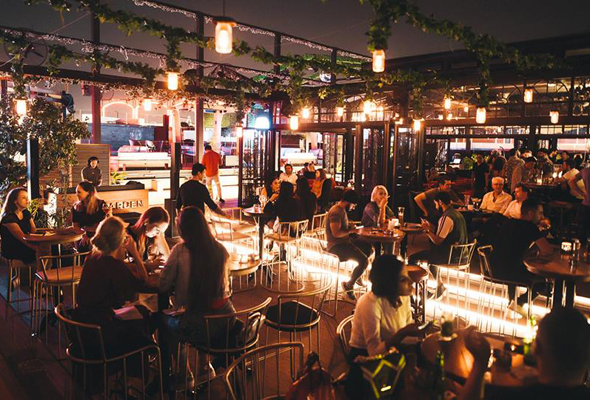 Here are 50 of the best outdoor bars in Dubai. 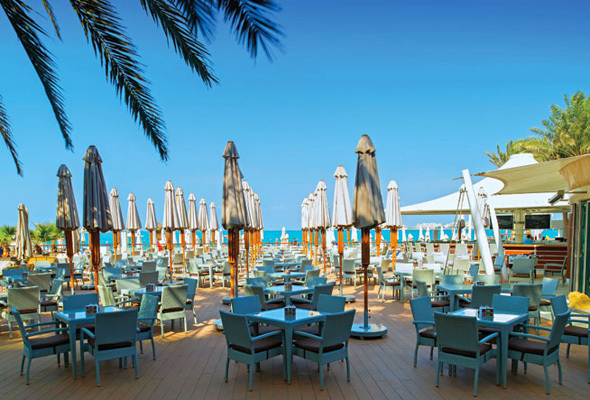 The perfect spot for a laidback beverage, Wavebreaker has live sport on LCD screens, shisha, a BBQ menu, and it’s right on the beach. VIEWS: Wavebreaker boasts ocean views from the terrace. FOOD: Meat and seafood fresh from the charcoal BBQ. GO FOR: Low-key weekend drinks. 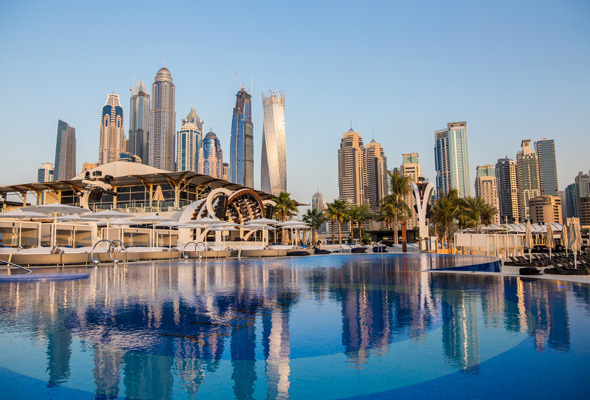 In a prime location overlooking the Sky Dive Dubai drop zone, the futuristic Zero Gravity is a bar, restaurant and beach club. VIEWS: Sand, sea, and sky-divers drifting back to earth. FOOD: A full and eclectic menu of breakfast, lunch and dinner dishes. GO FOR: Topping up your tan over a tipple. 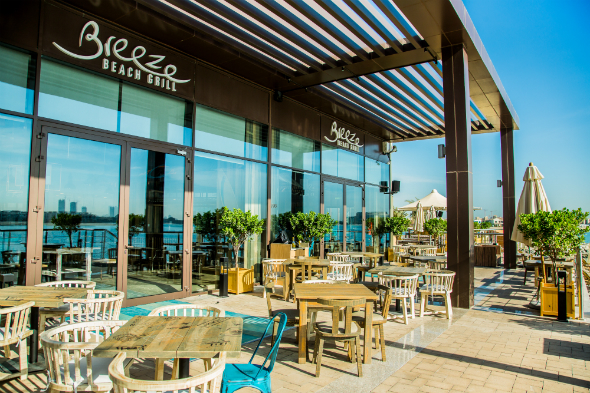 Holiday vibes abound at this beachside lounge at the Sheraton on JBR. VIEWS: The curved banquettes enjoy uninterrupted views of the sea. FOOD: Sushi and tapas dishes that are ideal for sharing. GO FOR: Cocktails and nibbles with friends. A more glamorous option in the same hotel as Wavebreaker, Pure Sky Lounge is up on the 35th floor. VIEWS: The blue and white colour scheme and ocean views give the venue an Ibiza vibe. FOOD: Grazing plates and grills. GO FOR: Glammed up cocktails or bubbles. 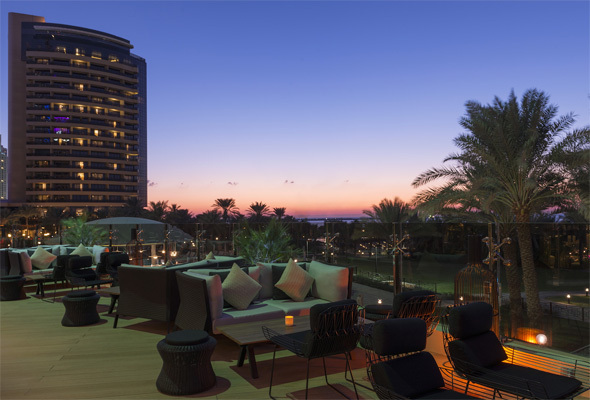 Part pool and beach, part lounge, Azure Beach expands out across the pool and lounge at the Rixos Premium JBR. FOOD: Typical poolside snacks such as sandwiches, salads, pizza and burgers. GO FOR: A chilled day by the pool. 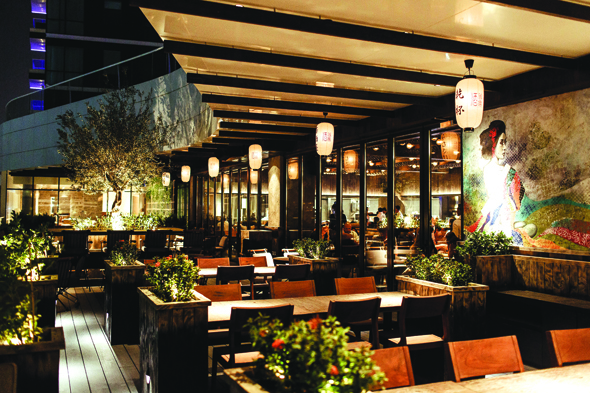 This open plan terrace is filled with restaurant and lounge seating offering a tranquil setting for a chic evening of Asian bites and cocktails. 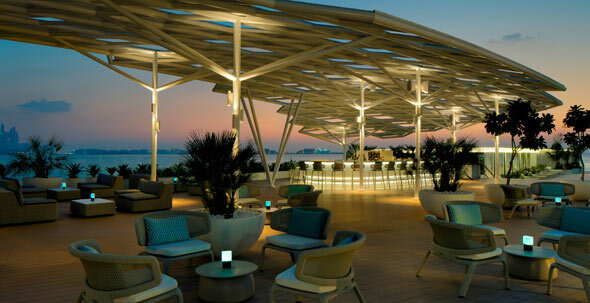 VIEWS: Views of the gardens and Arabian Gulf are lit up by a warm u shaped bar. GO FOR: The flaming bar counter- theatrical flaring at it’s finest. The beach bar that needs no introduction. 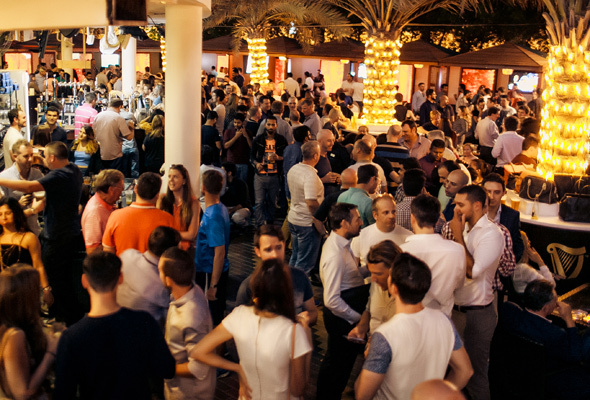 It’s a Dubai institution that packs out with party people every weekend. VIEWS: Sitting right on the beach makes it a pretty sweet place to watch the sun go down. FOOD: The restaurant serves breakfast, lunch and dinner. GO FOR: Live sport on big screens, lively lunches, and late night dancing. 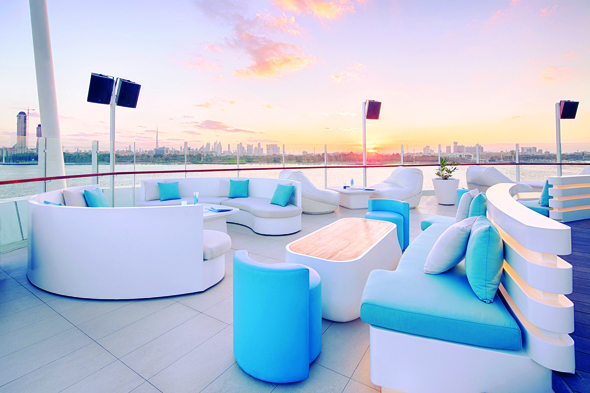 One of the best looking bars in Dubai, Jetty Lounge is all about classy cocktails, chilled out tunes and stunning sunsets. Book a table if you’re a big group. VIEWS: Pretty special. Accessed via a winding path through the lush gardens of the One&Only Royal Mirage, Jetty Lounge is perched right on the sand, with sweeping views of the ocean and the Palm. FOOD: Bar snacks and mezze. GO FOR: Jetty Lounge is great for impressing visitors or celebrating a special occasion – plus the jetty screams sunset photo opportunity. As pretty as this bar is inside, it’s even better out on the terrace, where you’ll find a glam crowd mingling around the pool or lounging on leather cushions. VIEWS: Grosvenor House is a great vantage point to take in the twinkling lights of the marina by night. 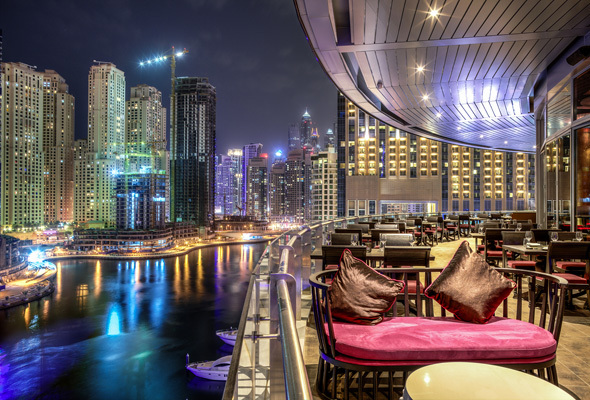 A rooftop bar in the heart of Dubai Marina, the infinity pool here gives it wow factor. VIEWS: From the lofty heights of this rooftop terrace you can watch boats making their way along the water below. FOOD: Tapas and an a la carte menu with salads, sandwiches, burgers, grills and more. 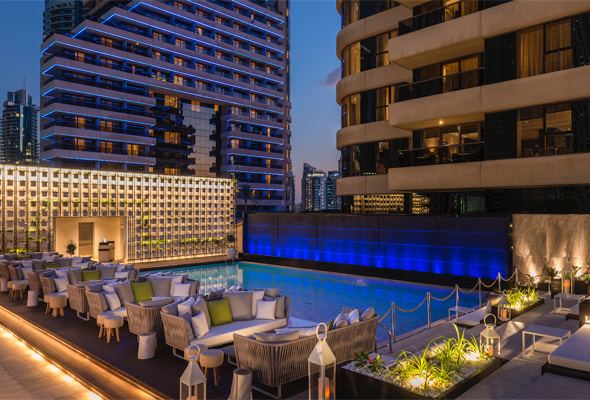 GO FOR: Poolside shisha surrounded by skyscrapers. FOOD: It’s proper British grub, with a great veggie section too. GO FOR: Killer Marina views. FOOD: Fuss-free food that’s all about fresh ingredients from Turkey and Greece with a Mediterranean influence. A huge terrace wraps around this circular venue inside Pier 7. VIEWS: Top notch. Asia Asia is a great spot for dinner overlooking the water. FOOD: Asian-inspired fare that’s perfect for sharing. GO FOR: A mid-week dinner or inventive weekend cocktails. VIEWS: The views (largely of neighbouring office buildings) aren’t the main reason to visit Coco Lounge. 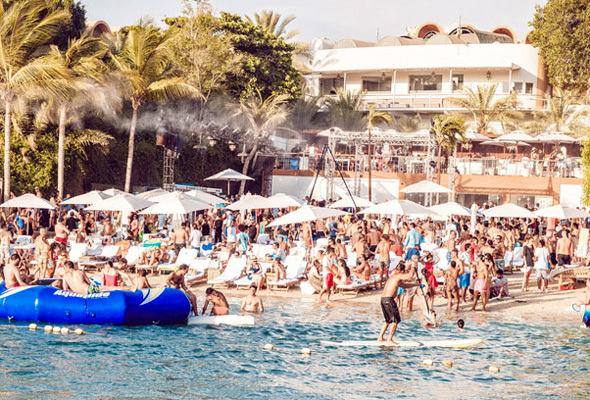 Go instead for the happy hour deals, picturesque poolside setting and DJ sets. FOOD: It serves light bites and bar snacks. GO FOR: A post-work wind-down. 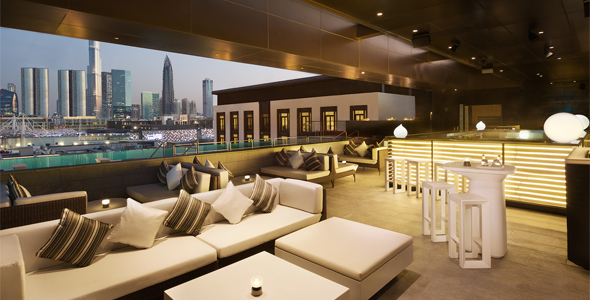 You’ll find seductive lighting and DJ beats at this glamorous terrace bar in the heart of Dubai Media City. VIEWS: Sit back and watch as twilight falls over the Dubai Marina skyline. FOOD: Nibbles, sandwiches and grills with an Arabic influence. GO FOR: The popular Vibes party nights and stop-and-stare views of the Marina skyscrapers. Reform has the British gastro-pub thing nailed, right down to the beer garden. Happy hours keep the after-work crowd happy during the week, and at the weekend it serves up one of our favourite roast dinners. VIEWS: Grassy lawns and lake views. FOOD: Reform serves food all day, including a cracking breakfast. GO FOR: Tasty pub grub in a pleasant garden setting. Nola remains one of JLT’s most consistently busy spots, regularly drawing in the drinkers and diners of JLT. Riva’s Gazebo Bar is next to the swimming pool and right on the beach. VIEWS: Across the water you can see the sail-shaped Burj al Arab back on the mainland. FOOD: Riva Ristorante serves up Mediterranean-inspired fare. 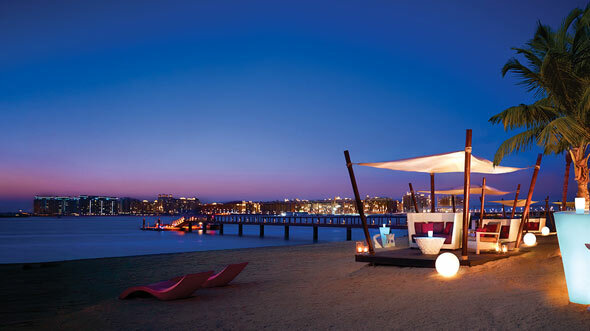 GO FOR: A beach day rounded off with a sundowner on the sand. 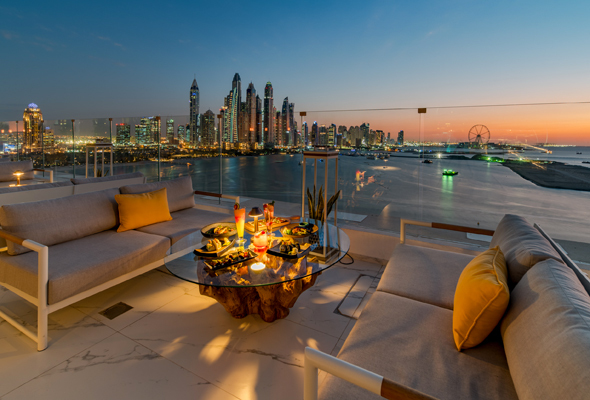 Perched atop party hotel FIVE Palm Jumeirah, The Penthouse is great both for sunbathing with Jumeirah views in the day, and partying with Dubai Marina views by night. 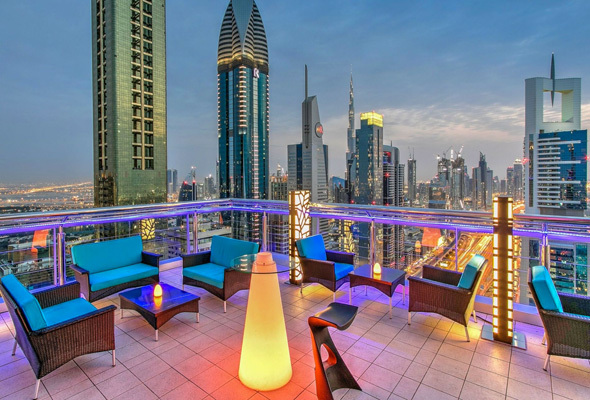 VIEWS: Pretty special – you get panoramic views across both Dubai Marina and towards the Burj Al Arab from either side. FOOD: An array of ‘Mediterrasian’ dishes from sushi and sashimi to beef short ribs. GO FOR: Either daytime or evening, just be sure to go – it’s one of the city’s best bars. Gazing out towards the Arabian Gulf is the aptly named Beach House. 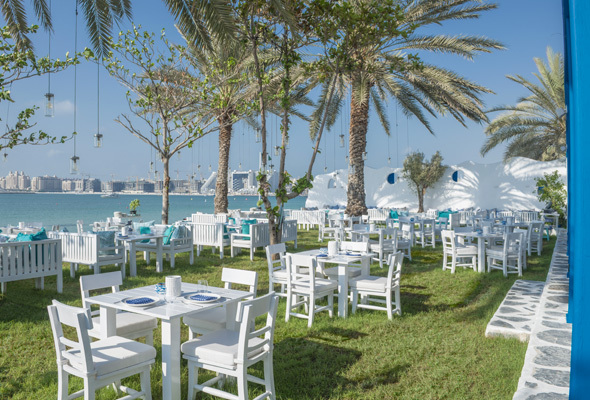 On the waters edge of Anantara The Palm it’s got great food in a family friendly setting. FOOD: Dining Al Fresco with friends and family. The martini glass of calamari is a must. 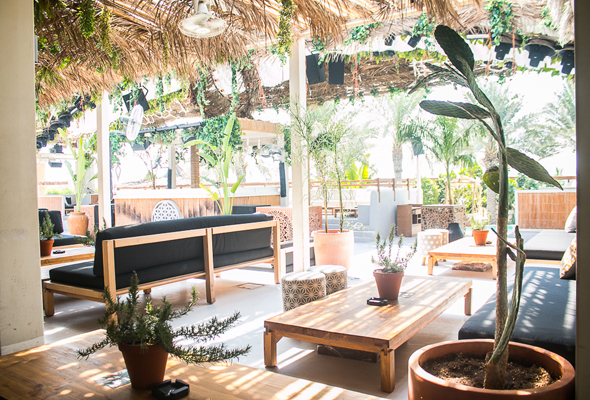 This leafy beach club is popular in equal measures for its chilled out beach days and lively house nights. It’s a bit of a drive, but it’s stunning decor makes up for it when you arrive. FOOD: It’s an extensive menu that goes above and beyond beachy bar bites. 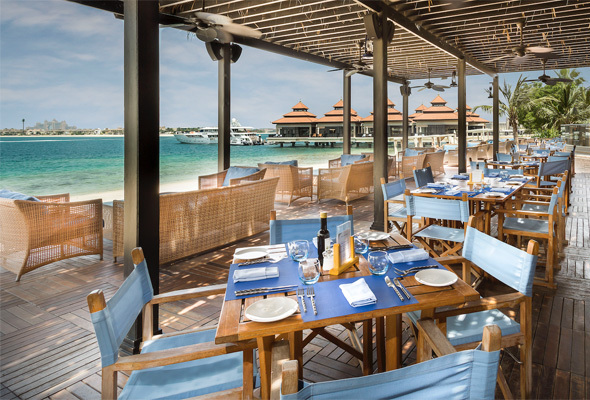 Nothing says life in Dubai quite like chilling on the terrace at Jumeirah Al Naseem’s Ambar. FOOD: Minimal, this bar is all about the top quality mixology. Watching the sun go down with a chilled glass of hops is hard to beat. As its name suggests, the Belgian Beer Café is a good spot for doing just that. VIEWS: The Arabian-themed waterways at the Madinat Jumeirah. FOOD: Belgian fare including frites, mussels and waffles. GO FOR: The cheesy Belgian frites and a vast array of beers. VIEWS: The beachfront restaurant and lounge extends out onto the beach, and you can watch the sun set over the water from the sand. GO FOR: Celeb spotting and an out-to-impress crowd. 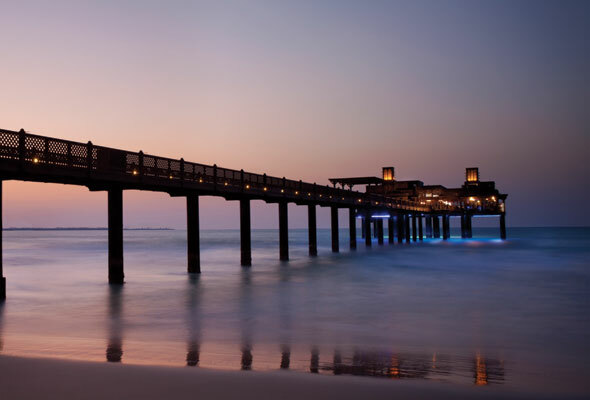 One of Dubai’s most romantic spots, Pier Chic calls the end of a Madinat Jumeirah Jetty home. FOOD: Seafood, and plenty of it. GO FOR: A special occasion, this one is on the higher end of the price scale, although a weekday business lunch is a more affordable Dhs199. 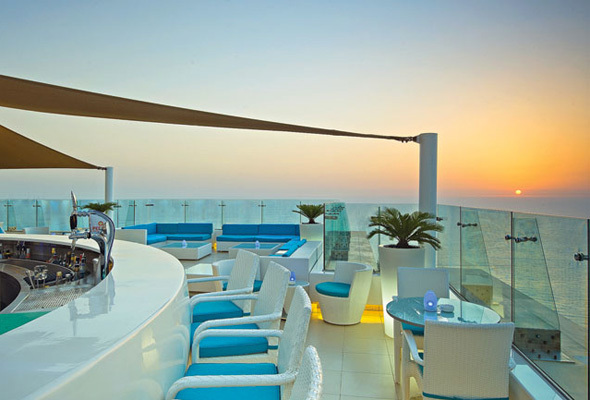 An outdoor champagne and cocktail bar on the 24th floor of the Jumeirah Beach Hotel. VIEWS: The sea in one direction, Jumeirah’s palatial villas in the other. FOOD: Tapas and light snacks. GO FOR: Post-work drinks and nibbles – there are daily deals on cocktails from 6pm. A modern take on European fine dining, this split level restaurant and bar has some of the Souk’s best sunset views. GO FOR: The prosecco pops, their happy hour special has become something of a signature, and it’s a well priced Dhs35. GO FOR: That smug feeling when you enter the security gates and head up the driveway to the Burj Al Arab. 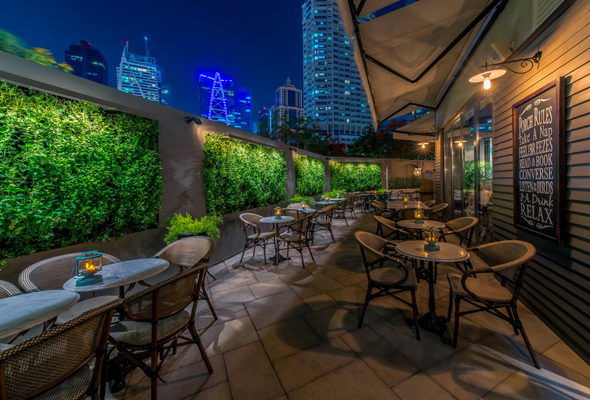 The terrace adjacent to the casual drinking Den dusty’s is a tranquil contrast to the bustle of DIFC. FOOD: It’s an international menu inspired by the owners travels, there’s a great business lunch option too. GO FOR: Casual after-work drinks or dinner. 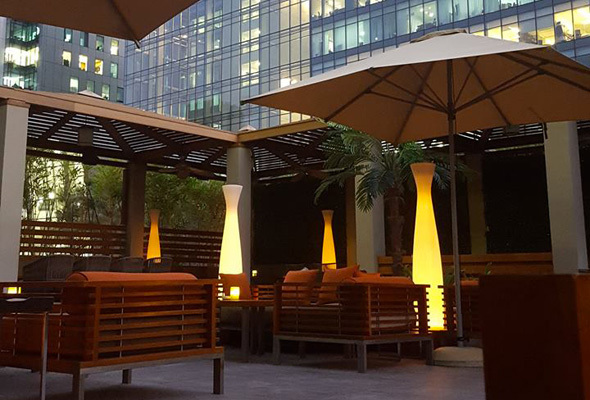 A new al fresco urban jungle, the expansive outdoor bar is a leafy spot that’s great for post-work drinks. It’s got a lively vibe with an excellent choice of botanical cocktails, herb infused drinks and floral inspired sharing menu. VIEWS: Not the best, it’s mainly the neighbouring construction. FOOD: It’s mainly about the drinks, but you can also order light bites designed to share. GO FOR: After work drinks, or ladies’ night on a Wednesday, it’s a chic midweek wind-down. Flair No.5, Ritz Carlton, DIFC, daily 5pm to 2am. Tel: (04) 372 2323. Metro: Emirates Financial Towers. ritzcarlton.com. 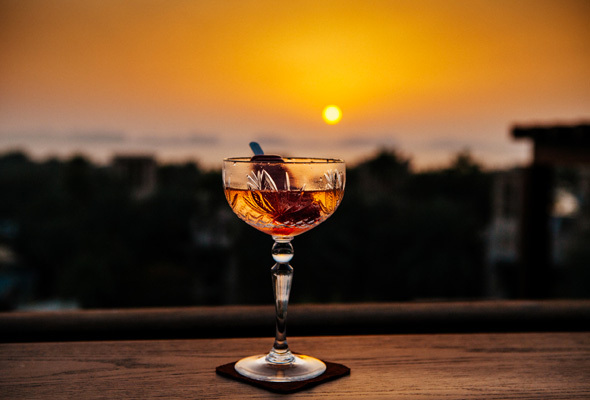 This Lebanese export overlooks the Dubai Canal in the JW Marriott Marquis and hosts a weekly Tuesday live music session, Friday night concept inspired by the Orient and dedicates Thursday’s to promoting talented local DJs who rotate deck duty. FOOD: A small but tempting menu of Asian-inspired dishes. GO FOR: Live music and a great vibe. This cocktail bar on the roof of the H Hotel is one of Downtown’s more romantic settings, with lots of low, lounge seating, flickering lanterns and palms wafting in the breeze. VIEWS: As you’d expect from a bar 40 floors up, the views are pretty impressive. It’s far better to see the World Trade Centre roundabout from up here than the back of a cab. GO FOR: Sunset and their fancy cocktails. A neon-hued rooftop lounge on top of the Four Points by Sheraton, Level 43. VIEWS: Above: the sparkling city skyline, and below: Sheikh Zayed Road in all its glory. FOOD: Quirky tapas, there’s also a new sushi bar headed in for the new season. GO FOR: Sundowners or pre-dinner cocktails. 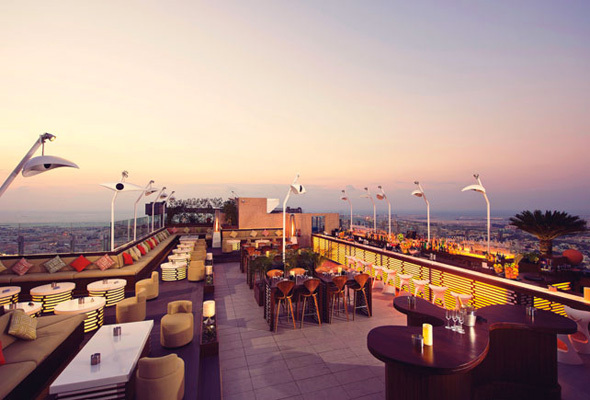 Iris is a pretty rooftop restaurant and bar on the 27th floor of the Oberoi Hotel. VIEWS: The Burj Khalifa and surrounding cityscape take centre stage. FOOD: International menu with a raw bar section. GO FOR: Sophisticated evening drinks, DJ sets and live music. GO FOR: Kickstarting your evening in a trendy setting. FOOD: It’s consistently good Pan- Asian food. 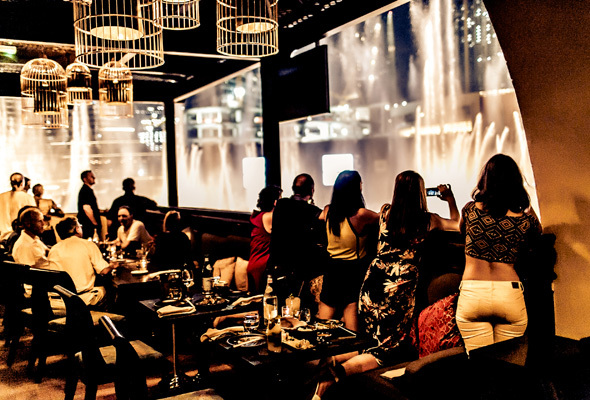 STK Downtown opened earlier this year, and it’s recently thrown open its doors to a stunning terrace too. FOOD: Steak. And lots of it. GO FOR: Brunch – it’s a lively affair and doesn’t compromise on food quality. If you’re fed up of glitzy hotel bars, the laidback beer garden at the Irish Village is the place to be. VIEWS: A miniature lake, grassy lawns, and the kitschy “village” itself – which includes a gift shop selling Tayto crisps and Irish chocolate. FOOD: Unpretentious, tasty pub fare in big portions. 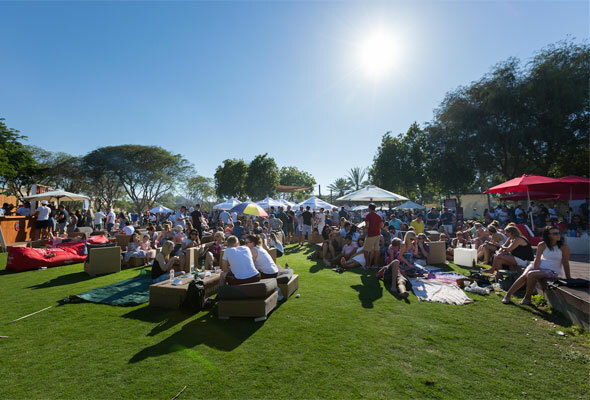 GO FOR: Laidback drinks during the day and regular live music sets in the evening. 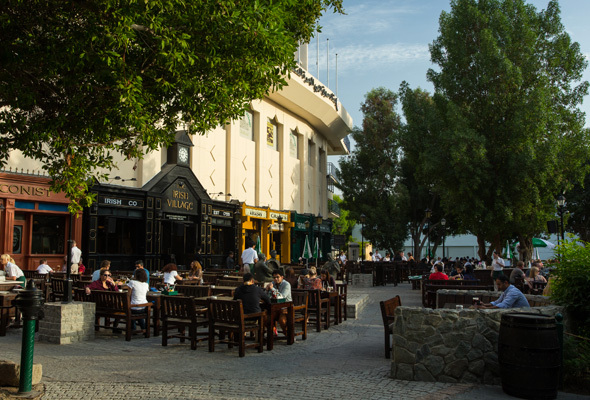 A favourite among long-term Dubai dwellers, QDs is a huge bar on decking next to Dubai creek. 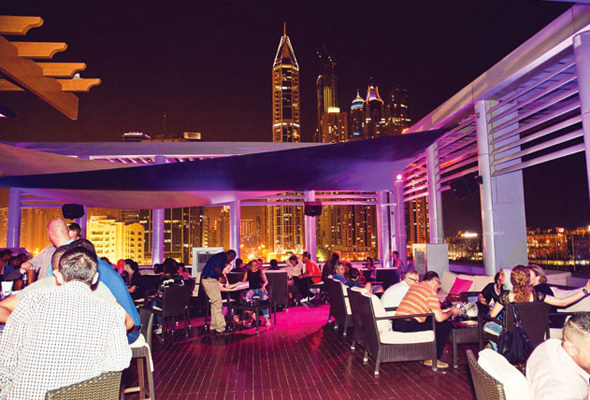 VIEWS: The restaurant sits right on the creek with a view of the Burj Khalifa across the water. GO FOR: A peaceful pint by the water. Cielo is as close as you can get to enjoying a drink on the deck of a ship without actually setting sail on one. It’s been designed to blend in with the yachts that bob on the creek below. VIEWS: Spectacular views across the creek to the Dubai skyline on the horizon. FOOD: You can order tapas to go with your sangria – Cielo’s specialty. GO FOR: Drinks before dinner by the water. The beautiful Noepe looks out onto the Dubai Creek, and its whitewashed interiors and laid back, luxe vibe make it a must-visit spot in Old Dubai. VIEWS: Stunning views of the marina, Dubai Creek and towards the Dubai Frame and Downtown Skyline. FOOD: Fresh seafood. Head down on a Saturday and graze your way through the lobster bake deal. 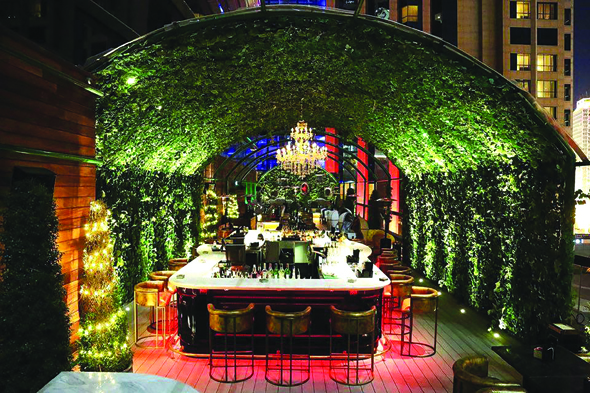 Soho Garden has shaken up Meydan’s drinking scene, and it’s four bars in one space set-up means there’s something for everyone. FOOD: Upscale bar food – the beef carpaccio is a must-try. 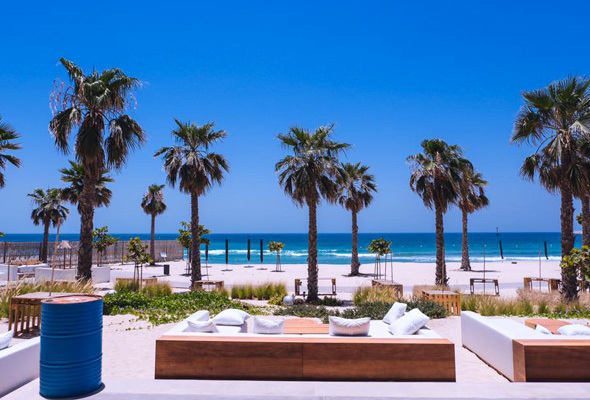 A 25-minute drive south of Dubai, this is somewhere to make a day of it with drinks and tunes from Ibiza pedigree DJs. VIEWS: Not much to shout about, but that’s why you came for the exclusivity. That said, the sun sets behind the banks across the waterway. FOOD: This is beach fare, but not as you know it. Excellent bites and more substantial plates for those sitting on the upper deck. 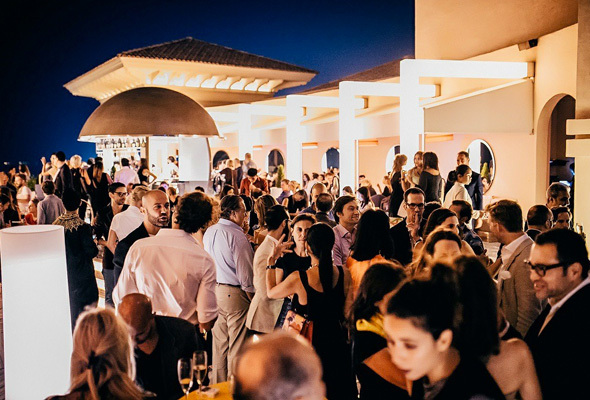 GO FOR: A day-long party with town’s chicest residents.